Letters and Papers, Foreign and Domestic, Henry VIII, Volume 13 Part 1, January-July 1538. Originally published by Her Majesty's Stationery Office, London, 1892. 483. John Baker to Cromwell. I have received a letter from Master Treasurer of the Household, showing that your Lordship has remembered me to the King, for which I cannot give you sufficient thanks. I never looked for anything of such importance but by your favour. I send a poor remembrance by my brother Bowes, not a twentieth part of the value I should give if I were able. 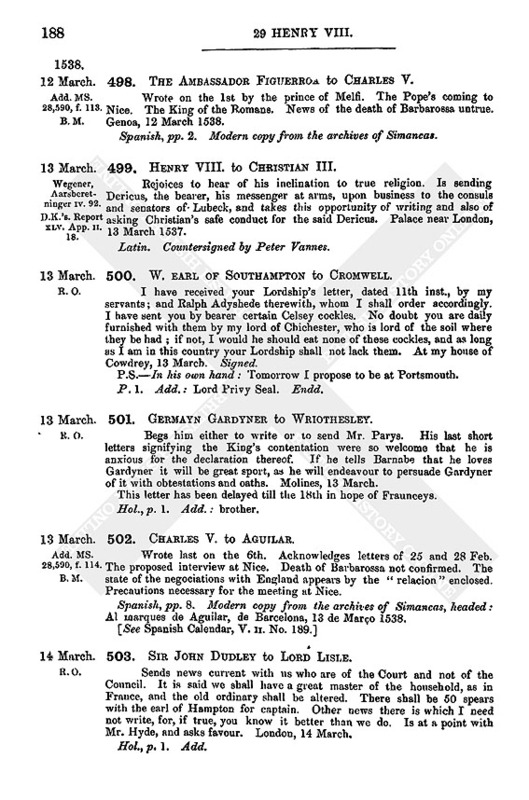 Tomorrow I must meet Mr. Sidney, Mr. Clement, and others on the contents of your Lordship's letters of the 4 March, and then I must return to speak to Sir Alexander Colepeper and others, dwelling in the edge of Kent and Sussex, about the seditious words concerning the levying of the Fifteenth and Tenth. Excuses himself for not attending on Cromwell as his wife has been long very sick, and requests Cromwell to deliver his bill to Bowes. 11 March. Signed. 484. John Wellysburn to Cromwell. Mr. Williams, with the Masters Carpenter and Mason have "made their platte of an evil cast house as ever they did see," and have made quick speed with the partitions and paving of the church to the barges. The King shall have a great deal of lead if it be not too thin worn, and great plenty of stones, which are bestowed at the water side, for 100 loads. Thanks Cromwell for his last letter, putting him in comfort for his suits. The lewd priest (fn. n1) has said that he found good mastership at London and better than he thought to find, and that Wellysburn could do himself nor no man else good or harm. Desires to be recommended to the King. Abendon, 11 March. 485. J. Chaderton to the Earl of Southampton. Yesterday morning anchored nigh the Horse, between this and the Wight, an "Arogasey," a ship of 400 or 500, coming from Hampton, where she was laden. Towards night came in at the Needles, four Frenchmen of two tops apiece, and shot some ordnance at her and she at them, but as the weather was foul they anchored beside her for the time. They of the ship induced Thos. Hancokkes and the writer to pilot them into this haven, but us she was coming in this morning she ran aground "besides the Windmill hill at this town called Palshyds Bulwerk." The crew thereupon began to cast their goods ashore and forsook her and the Frenchmen boarded her, hauled her off, and be gone with her towards St. Helen's. The ordnance of the town was out of order and could not be shot. The Frenchmen shot divers pieces of ordnance amongst the men of the town who came to make a rescue. If they pass not St. Helen's with her this day the writer, with Thos. Hancokkes and others of the town, will go on board the Frenchmen and do what they can to stay her; for she was taken in manner within the haven, Portsmouth, Monday, 11 a.m. Hol., pp. 2. Add. : high admiral. Endd. : 11 March. 486. T. Lord Mounteagle to [Cromwell]. Has received his letters of the 10 Feb. of the complaint of Roger Proctor, Thomas Battersby, and others, that he had unjustly expulsed them of certain tithes in Austweke. He had acted in perfect equity and good conscience. Begs him to be a good lord to him touching the abuses of his wife. Some great men hold more to her part than to his notwithstanding her ungoodly conversation, to which he had for some time been blinded. Fears his sufferance has made the King and his Lordship despise him. Trusts he will never fail in the King's service considering his Grace's kindcess to him and to his father. Horneby Castle, 11 March. Signed. 487. The Fasting of Mabel Brigge. 1. That one Mabel Brigge came to the house of John Lokkar at Reysome Grange, a se'nnight before Cross Days last, with two children, and immediately afterwards one Nelsone, the farmer of Risome Garth, sent his maiden, one Margaret, to the foresaid Lokkar, desiring that the above named Mabel might remain and he would see her costs paid. John and Agnes Lokkar then perceiving that the said Mabel fasted the next Friday, Saturday, and Sunday till mass was done, asked her why she did so. She replied that is was a charitable fast, and said she had never so fasted before but once for a man, and he brake his neck or it were all fasted, and so she trusted that they should do that had made all this business and that was the King and this false Duke. (fn. n2) John Lokkar asked her why she fasted it so, and she said she was hired by Isabel, William Bukke's wife, for the above intent, on which Lokkar put her out of the house and went to Isabel Bukke, who admitted that she had hired her so to fast and came with Lokkar to her own house, where she said Mabel was. Lokkar was angry and rebuked them, and Isabel went home and declared the matter to her husband, who went and entreated Lokkar to let the matter go no further. Isabel Bukke also said, she took this fast at her ghostly father, Sir Thomas Marshall, chantry priest at Hompton (Holmpton). Then old Bukke and his son sent for Lokkar and prayed him to be good and let (i.e., prevent) this matter to be opened abroad, and young Bukke's wife gave him 3s. and 2 yds. of linen cloth. 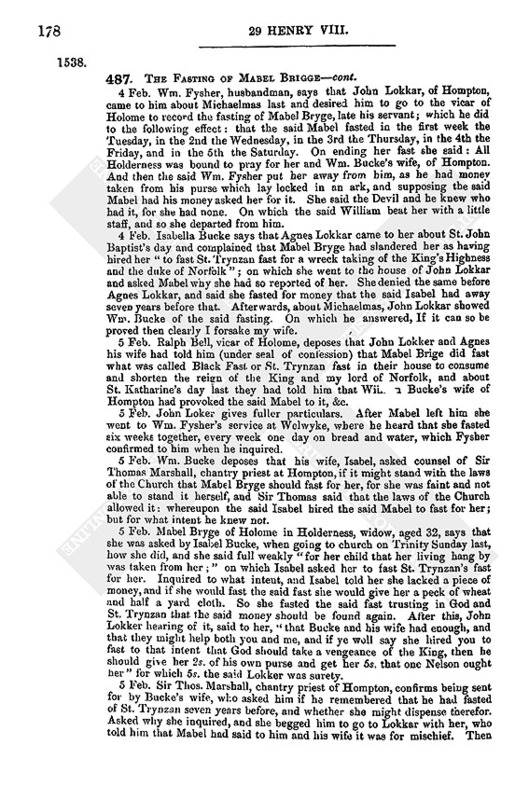 Mabel then departed from John Lokkar and went to William Fletcher in Welwik, where she took another fast calling it the Black Fast, and said Now I have ended this fast and all Holderness may pray for Bukke's wife and me. Signatures (copied) of the examining justices. When the premises were disclosed to my lord President and Council at Newcastle, Sir Ralph Ellerker the younger was immediately sent to Holderness to examine and to attach all the persons suspected. The following are their examinations taken by the same Sir Ralph and others. ii. Examinations of Wm. Fysher of Wellwyke, Isabel, wife of Wm. Bucke of Hompton, Sir Ralph Bell, vicar of Holome (Hollym), Wm. Bucke and John Loker of Hompton, Mabel Bryge, late of Hompton, and Sir Thomas Marshall, chantry priest there, examined before Sir Ralph Ellerker, Sir John Constable the elder, Sir Ralph Ellerker the younger, Sir John Constable the younger, James and Thomas Ellerker, and John Wright, at Constable Burton, 4 and 5 Feb. 29 Henry VIII. 4 Feb. Wm. 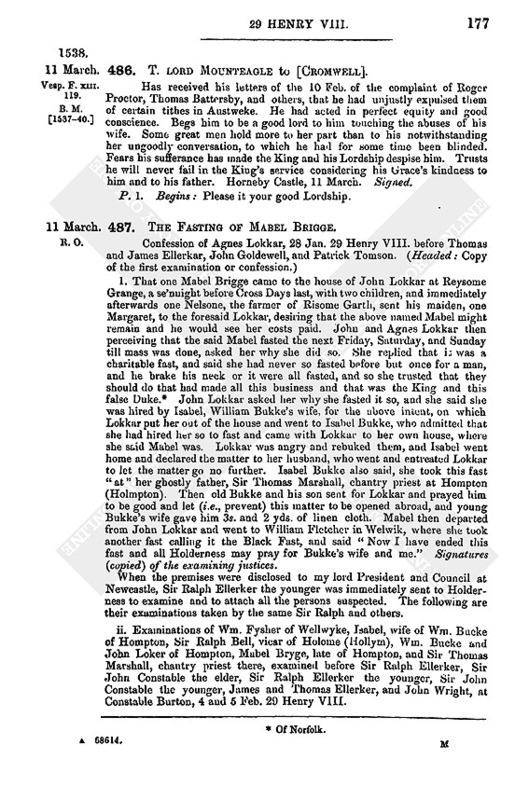 Fysher, husbandman, says that John Lokkar, of Hompton, came to him about Michaelmas last and desired him to go to the vicar of Holome to record the fasting of Mabel Bryge, late his servant; which he did to the following effect: that the said Mabel fasted in the first week the Tuesday, in the 2nd the Wednesday, in the 3rd the Thursday, in the 4th the Friday, and in the 5th the Saturday. On ending her fast she said: All Holderness was bound to pray for her and Wm. Bucke's wife, of Hompton. And then the said Wm. Fysher put her away from him, as he had money taken from his purse which lay locked in an ark, and supposing the said Mabel had his money asked her for it. She said the Devil and he knew who had it, for she had none. On which the said William beat her with a little staff, and so she departed from him. 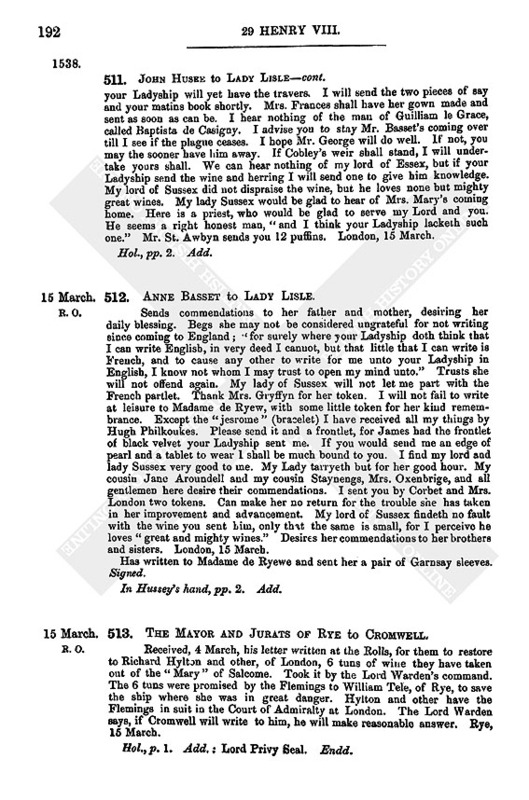 4 Feb. Isabella Bucke says that Agnes Lokkar came to her about St. John Baptist's day and complained that Mabel Bryge had slandered her as having hired her "to fast St. Trynzan fast for a wreck taking of the King's Highness and the duke of Norfolk"; on which she went to the house of John Lokkar and asked Mabel why she had so reported of her. She denied the same before Agnes Lokkar, and said she fasted for money that the said Isabel had away seven years before that. Afterwards, about Michaelmas, John Lokkar showed Win. Bucke of the said fasting. On which he answered, If it can so be proved then clearly I forsake my wife. 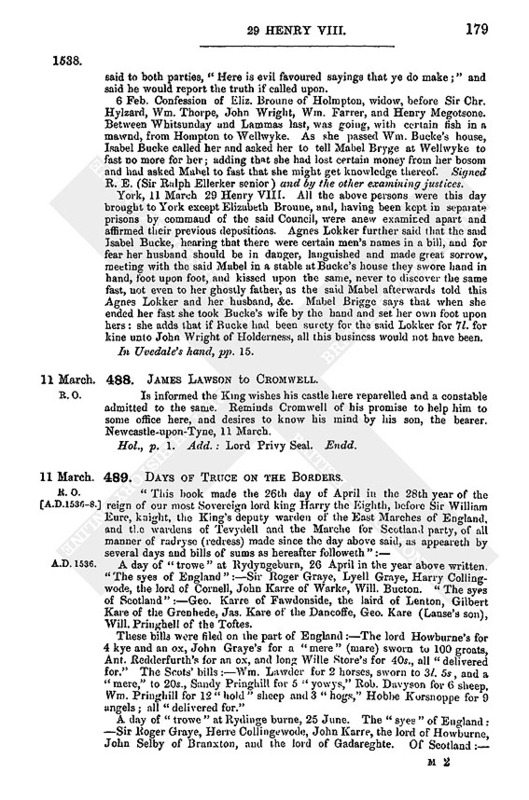 5 Feb. Ralph Bell, vicar of Holome, deposes that John Lokker and Agnes his wife had told him (under seal of concession) that Mabel Brige did fast what was called Black Fast or St. Trynzan fast in their house to consume and shorten the reign of the King and my lord of Norfolk, and about St. Katharine's day last they had told him that William Bucke's wife of Hompton had provoked the said Mabel to it, &c.
5 Feb. John Loker gives fuller particulars. After Mabel left him she went to Wm. Fysher's service at Welwyke, where he heard that she fasted six weeks together, every week one day on bread and water, which Fysher confirmed to him when he inquired. 5 Feb. Wm. Bucke deposes that his wife, Isabel, asked counsel of Sir Thomas Marshall, chantry priest at Hompton, if it might stand with the laws of the Church that Mabel Bryge should fast for her, for she was faint and not able to stand it herself, and Sir Thomas said that the laws of the Church allowed it: whereupon the said Isabel hired the said Mabel to fast for her; but for what intent he knew not. 5 Feb. Mabel Bryge of Holome in Holderness, widow, aged 32, says that she was asked by Isabel Bucke, when going to church on Trinity Sunday last, how she did, and she said full weakly "for her child that her living hang by was taken from her;" on which Isabel asked her to fast St. Trynzan's fast for her. Inquired to what intent, and Isabel told her she lacked a piece of money, and if she would fast the said fast she would give her a peck of wheat and half a yard cloth. So she fasted the said fast trusting in God and St. Trynzan that the said money should be found again. 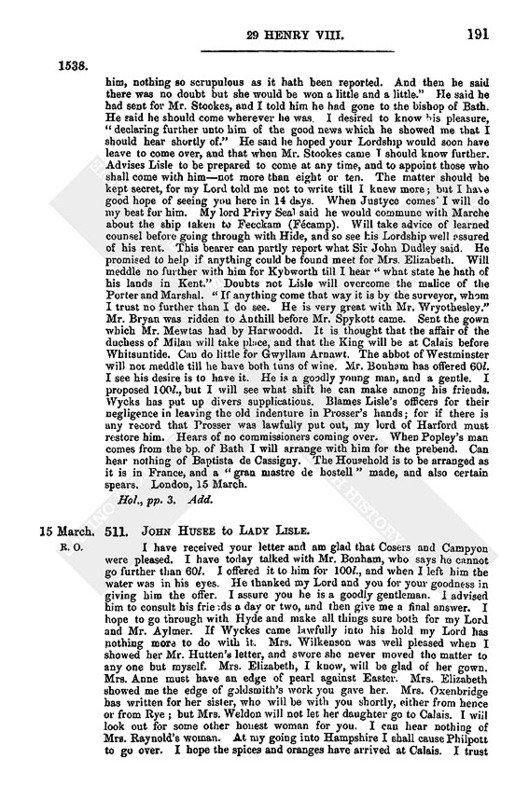 After this, John Lokker hearing of it, said to her, that Bucke and his wife had enough, and that they might help both you and me, and if ye woll say she hired you to fast to that intent that God should take a vengeance of the King, then he should give her 2s. of his own purse and get her 5s. that one Nelson ought Her for which 5s. the said Lokker was surety. 5 Feb. Sir Thos. Marshall, chantry priest of Hompton, confirms being sent for by Bucke's wife, who asked him if he remembered that he had fasted of St. Trynzan seven years before, and whether she might dispense therefor. Asked why she inquired, and she begged him to go to Lokkar with her, who told him that Mabel had said to him and his wife it was for mischief. Then said to both parties, "Here is evil favoured sayings that ye do make;" and said be would report the truth if called upon. York, 11 March 29 Henry VIII. All the above persons were this day brought to York except Elizabeth Broune, and, having been kept in separate prisons by command of the said Council, were anew examined apart and affirmed their previous depositions. Agnes Lokker further said that the said Isabel Bucke, hearing that there were certain men's names in a bill, and for fear her husband should be in danger, languished and made great sorrow, meeting with the said Mabel in a stable at Bucke's house they swore hand in hand, foot upon foot, and kissed upon the same, never to discover the same fast, not even to her ghostly father, as the said Mabel afterwards told this Agnes Lokker and her husband, &c. Mabel Brigge says that when she ended her fast she took Bucke's wife by the hand and set her own foot upon hers: she adds that if Bucke had been surety for the said Lokker for 7l. for kine unto John Wright of Holderness, all this business would not have been. In Uvedale's hand, pp. 15. 488. James Lawson to Cromwell. Is informed the King wishes his castle here reparelled and a constable admitted to the same. Reminds Cromwell of his promise to help him to some office here, and desires to know his mind by his son, the bearer. Newcastle-upon-Tyne, 11 March. Hol., p. 1. Add; Lord Privy Seal. Endd. 489. Days of Truce on the Borders. A day of "trowe" at Rydyngeburn, 26 April in the year above written. The syes of England":—Sir Roger Grave, Lyell Grave, Harry Colling wode, the lord of Cornell, John Karre of Warkp, Will. Bucton. "The syps of Scotland":—Geo. Karre of Fawdonside, the laird of Lenton, Gilbert Kare of the Grenhede, Jas. Kare of the Dancoffe, Geo. Kare (Lanse's son) Will. Pringhell of the Toftes. These bills were filed on the part of England:—The lord Howburne's for 4 kye and an ox, John Grave's for a mere (mare) sworn to 100 groats, Ant. Redderfurth's for an ox, and long Wille Store's for 40s., all delivered for. The Scots' bills:—Wm. Lawder for 2 horses, sworn to 3l. 5s, and a mere, to 20s., Sandy Pringhill for 5 "yowys," Rob. Davyson for 6 sheep, Wm. Pringhill for 12 "hold" sheep and 3 "hogs", Hobbe Korsnoppe for 9 angels; all "delivered for." A day of "trowe" at Rydinge burne, 25 June. The "syes" of England: —Sir Roger Graye, Herre Collingewode, John Karre, the lord of Howburne John Selby of Branxton, and the lord of Gadareghte. Of Scotland:— The lard of Lenton, Mark Karre of Kepelawe, the lard of Grene Hede, Wm. Karre, George Pringhill, Robyn Davyson. "Willm. Revele delivered to the lard of Lenton for iii nags." Ridinge burne, 4 July. England:—Sir Robert Allarkarre, Sir Roger Graye, Herre Collingewode, John Karre, Rauffe Revele, Alex. Shaftho, Scotland:—Dande Karre of Lytelden, Robyn Davyson of Hadderlands, John Yonge of Sesfurthe, George Pringhell of the Tanlawe. "The filing of the English bills":—Mathew Browne for 6 oxen and 2 kye, the porter of Berwick for 14 "wedders," Thomas Hewarde for a horse sworn to 4l. 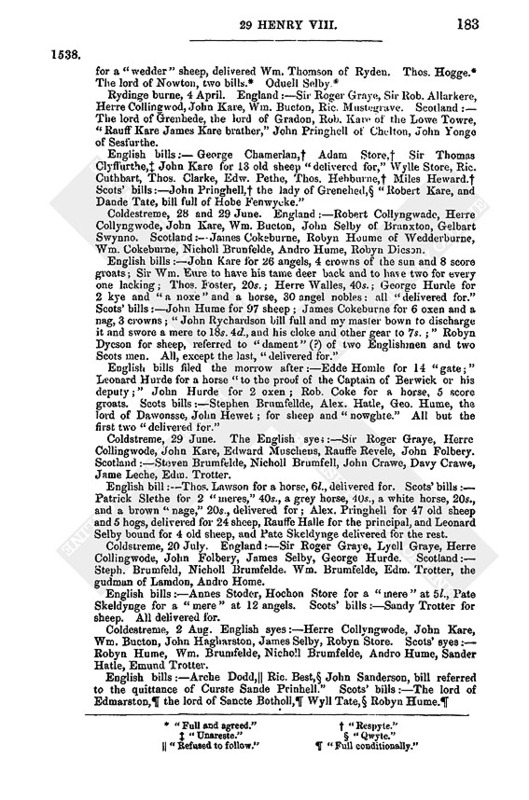 Scolts' bills:—Thome Davyson for 14 yowys and wedders, Davy Kare, of a horse and sworne to iiii. angels. All "delivered for." Karram Kyrke, 23 July. England:—The lord of Horton, Herre Collyng wode, John Kare, the lord of Cornell, the lord of Gadareght, John Selby of Branxton. Scotland:—The lord of Lenton, Robyn Karre, John Yonge of Sesfurthe, Wat Yonge of Lenton, James Davyson, Robyn Davyson. English bills:—Sandy Cuthbart for a "mere". Scots' bills:— "The lady of Bucklowe bill full of Emuude Arkell." Ridynge burue, 11 Sept. England:—Lyell Graye, Wm. Bucton, Herre Collingwod, John Kare, the lord of Folbery, Jaret Selby. Scotland:— George Kare, Thomas Kare, George Pringhill, Dand Tate, Gelbart Kare, Robyn Kare. 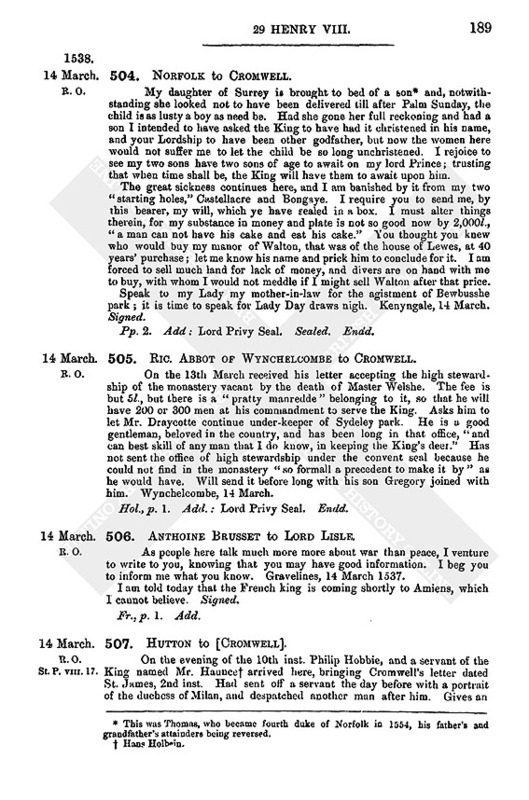 English bills:—Sir Roger Graye, bill full, of a horse "so that he make proof with this neghtbures that the horse is his," the lord of Helderton bill full conditionally of Mungay Dowles. Scots' bills:—Thomas Potte, bill of Karslawe; Patrick Brumfeld, bill of Wille Downe; Dand Tate, bill of Flory Foster: all full, conditionally. Ridinge Burne, 25 Sept. England:—Lyell Graye, Oduell Selby, Wm. Bucton, John Selby of Branxton, Ric. Musgrawe, Edw, Muschens. Scotland:—George Kare of Fawdonsyde, Robyn Kyre of the Lowght towre, George Pringhill of the Tanelawe, John Yonge of Otterburne, Dand Tate, My hell Redderfurth. English bills:—Oduell Selby, "respet by consent of the parties"; the Porter's bill (i.e. of Berwick)full of Trobelans and delivered for; Sandy Then; the lord of Gadareght. (fn. n3) Bills of Scotland:—Dand Tate, (fn. n3) Pate Brumfeld, full of Wylle Downe, Thome Potte, full of Kareslawe. Rydynge burne, 5 Oct. England:—Sir Robert Allarkare, Herre Colling wode, Jaret Selby, Wm. Bucton, John Karre, Edw. Muschens. Scotland:— George Kare, Wylle Kare, Dand Kare, Wate Kare, Robyn Davyson, Dand Tate. Filing of the English bills:—Oduell Selby, Edward Muschens, Ric. Folbery, (fn. n3) George Chammarlen, (fn. n4) Herre Preston, (fn. n4) and the lord of Helderton. (fn. n4) Filing of the Scots' bills:—"Dand Tate, bill qwyte a nother bill of Dand Tate's,full for lacke of apperans, John Kare, (fn. n3) Dande Whyte, bill full condicionally of Ric. Fenkyll and Sir Roger Fenkyll qwite; Dand Yonge, bill full for lacke of apperans." Kylsay, 18 and 19 Oct., "and what was done the said days." "The assyes":—George Kare of Fawdonsyde, Gelbart Kare of the Grenhede, George Pringhill, Robyn Davyson of Hadderlands, John Browne of Halishousle, James Yonge the Gowne. English bills:—Oduell Selby, (fn. n5) Gilbert Scot, (fn. n5) Sir Robert Allarkare, Sandy Cuthbart, Thos. Yongher, Cuthbart Whit, (fn. n5) Jaret Selby, (fn. n6) Thomas Clarke, Wille He warde, (fn. n7) Thome Fenvycke, (fn. n5) John Yolle, (fn. n5) Thome Jackeson, (fn. n5) Edward Stwart, (fn. n5) James Willson, (fn. n5) Hobbe Syngellton, (fn. n5) Herre Collyngwod, (fn. n5) Rauff Heward, Adam Store, (fn. n8) Sandy Store, Peter Foster, two bills of Oduell Selby's (fn. n9), John Kare (fn. n10), John Smythe, Parson Ogell (fn. n11), George Chamerlane, (fn. n10) the lord of Helderton, Herre Preston bill full of Jocke Thomson dwelling in England, wherefore Scotland have to make no redress, George Chamerlen, bill respet to the next meeting by consent of the parties, Adam Store, (fn. n9) Sir Wm. Eure, (fn. n12) Herre Walles, (fn. n9) Thome Store, , (fn. n11) Robyn Wylkynson, (fn. n9) John Graye of Leremuthe, delivered, John Sanderson, (fn. n9) Alex. Shasho bills, (fn. n9) Thomas Store, (fn. n13) Rob. Claverynge, (fn. n9) the lord of Nowton, Edw. Pethe, John Horslay, respite, and the wardens to bring in the books of the trowys at the next meeting, and if the proof fall to John Horslay the bill to be filed and delivered with the lawsse of the bills, Sandy Then, Wm. Revele, (fn. n12) Jaret Selby, other ij bills of Jaret Selby's the one filed twhart owte and the other full conditionally, other two bills of Jaret Selby, (fn. n9) the master of Karram, Sir Rob. Allarkare, Wm. Stobe, Robt. Heward, (fn. n10) Rauffe Heward, (fn. n9) the captain of Berwick, (fn. n10) the lord of Nowton, the Porter. Cornell, 4 Nov.—The assyes:—Sir Roger Graye, Sir Robert Allarkare, Lyell Graye, Herre Collingwode, John Kare, and the lord of Cornell. A day of trowe at Ridynge burne 15 & 16 Nov., for swearing of the English bills that was fylet in Kelsaye and the Scots bills that was fylet in Cornell. 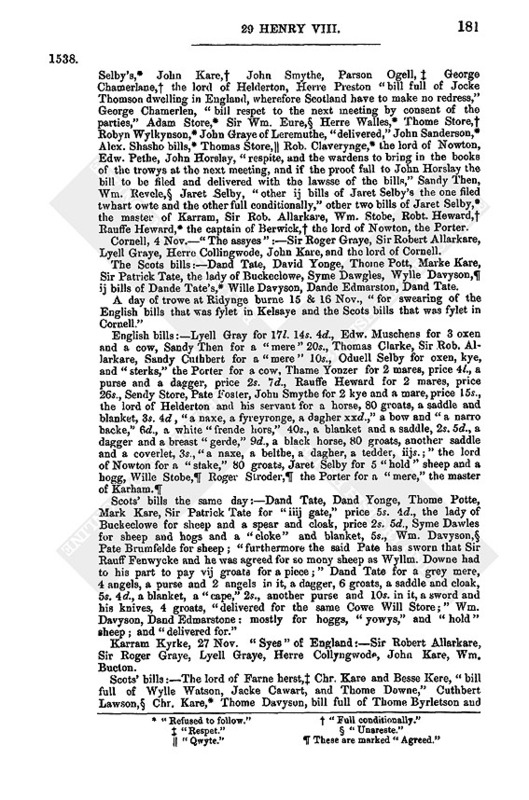 Scots' bills the same day:—Dand Tate, Dand Yonge, Thome Potte, Mark Kare, Sir Patrick Tate for iiij gate, price 5s. 4d., the lady of Buckeclowe for sheep and a spear and cloak, price 2s, 5d., Syme Dawles for sheep and hogs and a cloke and blanket, 5s., Wm. Davyson, (fn. n12) Pate Brumfelde for sheep; furthermore the said Pate has sworn that Sir Rauff Fenwycke and he was agreed for so mony sheep as Wyllm. Downe had to his part to pay vij groats for a piece; Dand Tate for a grey mere, 4 angels, a purse and 2 angels in it, a dagger, 6 groats, a saddle and cloak, 5s. 4d., a blanket, a cape, 2s., another purse and 10s. in it, a sword and his knives, 4 groats, delivered for the same Cowe Will Store; Wm. Davyson, Dand Edmarstone: mostly for hoggs, yowys, and hold sheep; and delivered for. Karram Kyrke, 27 Nov. Syes of England:—Sir Robert Allarkare, Sir Roger Graye, Lyell Graye, Herre Collyngwode, John Kare, Wm. Bucton. Herre Talyer, Dand Tate, (fn. n15) George Kennede, bill full of Wille Gedde, Wylle Vente for a principal mere of Ric. Yonge in Wollare and Careslawe, not to be delivered for to the Scots make proof that the said mere is theirs. Karram Kyrke, 18 Dec. England:—Sir Rob. Allarkare, Sir Roger Graye, Robert Collyngwode, Lyell Graye, Herre Collingwode, John Kare. Scotland:—George Kare of Fawdon syde, the lard of Lenton, the lard of Hunthall, George Kare of Gathos, John Yonge of Sesfurthe, Robyn Davyson of Haderlands. A Scot's bill. 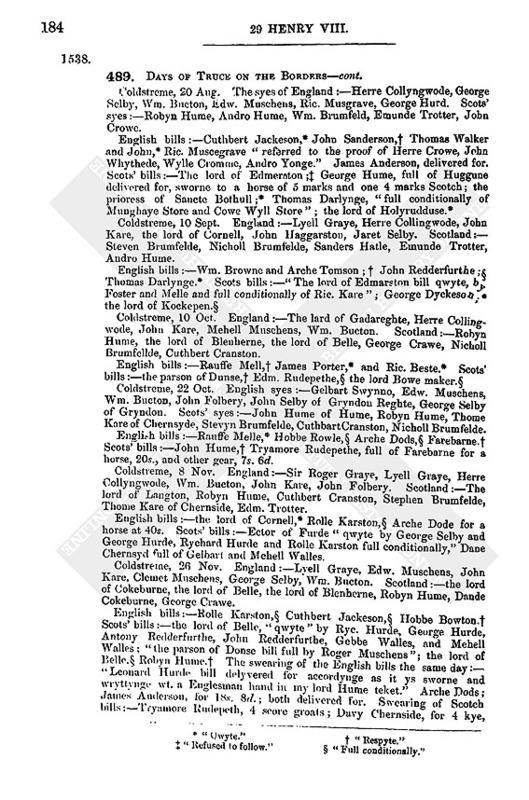 William Hamleton and the Chamberlain's bill of Kylsaye full of Wynkyng Wyll Elwode. Sproston Kyrke, 19 Dec. The syes of Scotland:—George Kare of Fawdonsyde, the lord of Lenton, John Yonge of Sesfurthe, Robyn Davyson of Hadderlands, Win. Pringhill, Rauffe Kare. Rydynge burne, 11 Jan. The syes of England:—Sir Roger Graye, Herre Collyngwode, Wm. Bucton, Jaret Selby, the lord of Howburne, George Hurde. Scots bills:—Wyll Prynghell, bill full of Edmund Store, Thome Store of Yerlande and Monghay Store. Another bill of Wyll Prynghell, qwyt by Sandy Store of Hethepoll and Cuth. Store. Cuddy Lawson, bill referred to the quittance of Dand Tate, Davy Mento, Hobby Lawson, Joke Yonge, Robyn Yonge, and Dand Yonge. Dand Yonge of the Wodesyde, bill full of Joke Pote. Dande Freman, bill full and a greyd by the master of Karram and Wylle Gedde. Rydynge burne, 22 Jan. The syes of Scotland:—George Kare of Fawdonsyde, Dande Kare of Lytelden, Wate Kare of Gradon, Dand Yonge of the Wodesyde, Dande Tate, RaufFe Kare. Rydynge burne, the last day of Feb.; for deliverance of bills filed before. The swearing of the Scots bills:—Wm. Hamhellton for 10 yowys and a horse sworn to iij angel nobles, delivered for the same Roger Stroder, Edwart West, Adam Store; Wm. Pringhell agreed by consent of the parties. Wm. Cowyng and Mehell Cowyng for 2 horses, 6 angel nobles, and a tedder and bridle, 8d., delivered for Roger Burhell of Furde. Chr. Kare for two oxen and a cow delivered for Matho Holyday. Thos. Davyson for v yowys and a hoge, delivered for Thomas Byrletson. Wm. Vente for a principal mere sworn to 2 angel nobles delivered Ric. Yonge of Wollare. George Kennede for a noxe and a kowe delivered John Kare of Warke. Dande Freman for xviij gese, vj holde gese, iiijs., xii yonge gese, iiijs. delivered Wm. Gedde and Andro the master of Karrhan man. Rydinge burne, 4 April. England:—Sir Roger Graye, Sir Rob. Allarkere, Herre Collingwod, John Kare, Wm. Bucton, Ric. Mustegrave. Scotland:—The lord of Grenhede, the lord of Gradon, Rob. Kare of the Lowe Towre, Rauff Kare James Kare brather, John Pringhell of Chelton, John Yongo of Sesfurthe. English bills:—George Chamerlan, (fn. n20) Adam Store, (fn. n20) Sir Thomas Clyflurthe, (fn. n21) John Kare for 13 old sheep delivered for, Wylle Store, Ric. Cuthbart, Thos. Clarke, Edw. Pethe, Thos. Hebburne, (fn. n20) Miles Heward. (fn. n20) Scots' bills:—John Pringhell, (fn. n20) the lady of Grenehed, (fn. n22) Robert Kare, and Dande Tate, bill full of Hobe Fenwycke. Coldestreme, 28 and 29 June. England:—Robert Collyngwade, Herre Collyngwode, John Kare, Wm. Bucton, John Selby of Branxton, Gelbart Swynno. Scotland:—James Cokeburne, Robyn Houme of Wedderburne, Wm. Cokeburne, Nicholl Brunfelde, Andro Hume, Robyn Dicson. English bills:—John Kare for 26 angels, 4 crowns of the sun and 8 score groats; Sir Wm. Eure to have his tame deer back and to have two for every one lacking; Thos. Poster, 20s. ; Herre Walles, 40s. ; George Hurde for 2 kye and a noxe and a horse, 30 angel nobles: all "delivered for." 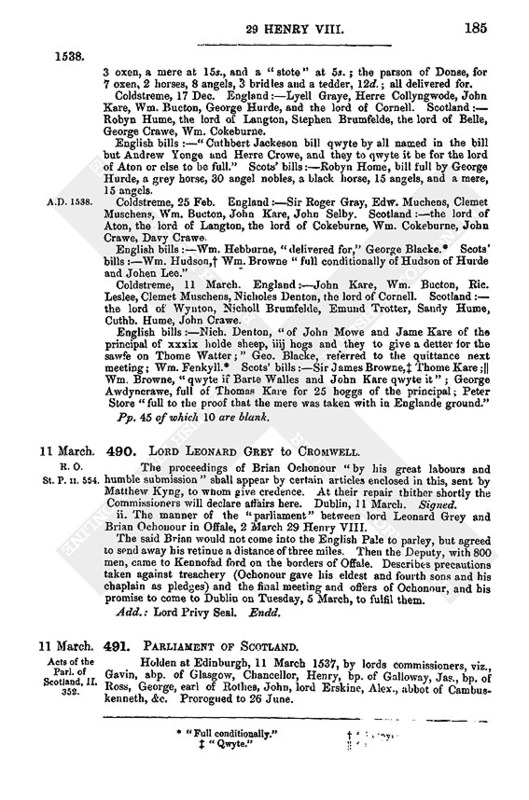 Scots' bills:—John Hume for 97 sheep; James Cokeburne for 6 oxen and a nag, 3 crowns; John Rychardson bill full and my master bown to discharge it and swore a mere to 18s. 4d, and his cloke and other gear to 7s. ; Robyn Dycson for sheep, referred to dament (?) of two Englishmen and two Scots men. All, except the last, delivered for. 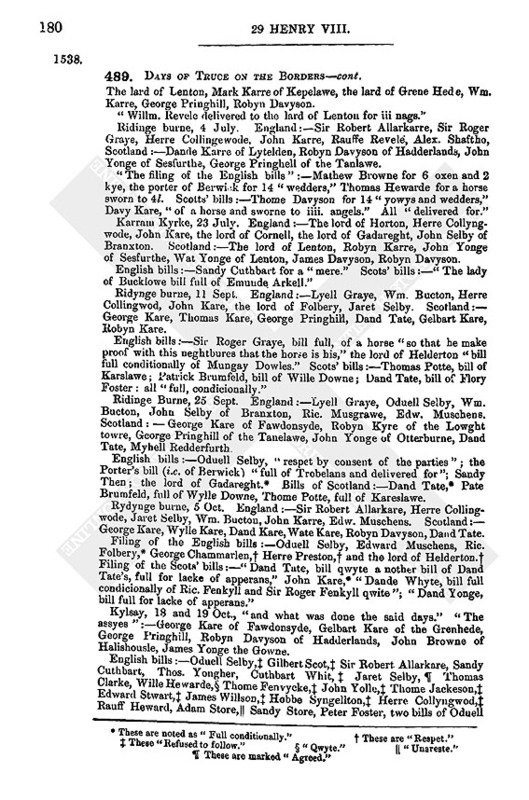 English bills filed the morrow after:—Edde Homle for 14 gate; Leonard Hurde for a horse to the proof of the Captain of Berwick or his deputy; John Hurde for 2 oxen; Rob. Coke for a horse, 5 score groats. Scots bills:—Stephen Brumfellde, Alex. Hatle, Geo. Hume, the lord of Dawonsse, John Hewet; for sheep and nowghte. All but the first two delivered for. Coldstreme, 29 June. The English sye;:—Sir Roger Graye, Herre Collingwode, John Kare, Edward Muscheus, Rauffe Revele, John Folbery. Scotland:—Steven Brumfelde, Nicholl Brumfell, John Crawe, Davy Crawe, Jame Leche, Edm. Trotter. English bill:—Thos. Lawson for a horse, 6I., delivered for. Scots' bills:— Patrick Slethe for 2 meres, 40s., a grey horse, 40s., a white horse, 20s., and a brown nage, 20s., delivered for; Alex. Pringhell for 47 old sheep and 5 hogs, delivered for 24 sheep, Rauffe Halle for the principal, and Leonard Selby bound for 4 old sheep, and Pate Skeldynge delivered for the rest. Coldstreme, 20 July. England:—Sir Roger Graye, Lyell Graye, Herre Collingwode, John Folbery, James Selby, George Hurde. Scotland:—Steph. Brumfeld, Nicholl Brumfelde. Wm. Brumfelde, Edm. Trotter, the gudman of Lamdon, Andro Home. English bills:—Annes Stoder, Hochon Store for a mere at 5l., Pate Skeldynge for a mere at 12 angels. Scots' bills:—Sandy Trotter for sheep. All delivered for. Coldestreme, 2 Aug. English syes:—Herre Collyngwode, John Kare, Wm. Bucton, John Hagharston, James Selby, Robyn Store. Scots' syes:— Robyn Hume, Wm. Brunifelde, Nicholl Brumfelde, Andro Hume, Sander Hatle, Emund Trotter. English bills:—Arche Dodd, (fn. n23) Ric. Best, (fn. 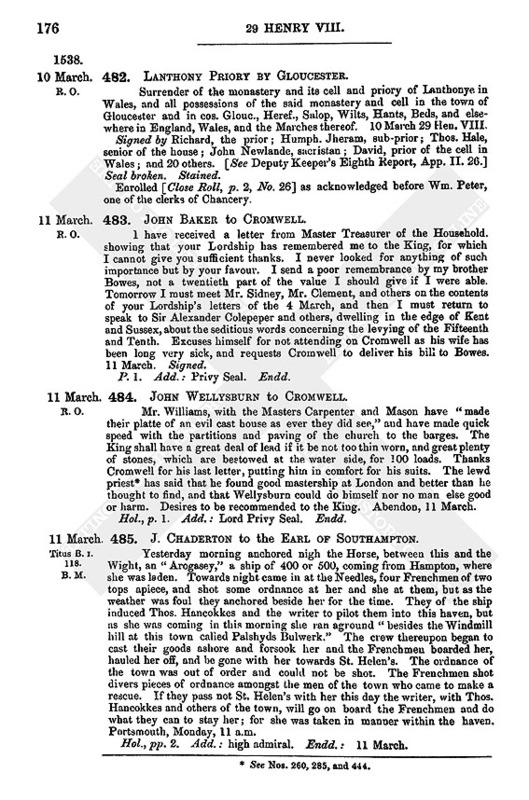 n22) John Sanderson, bill referred to the quittance of Curste Sande Prinhell. Scots' bills:—The lord of Edmarston, (fn. n24) the lord of Sancte Botholl, , (fn. n24) Wyll Tate, , (fn. n22) Robyn Hume. , (fn. n24) Coldstreme, 20 Aug. The syes of England:—Herre Collyngwode, George Selby, Wm. Bucton, Edw. Muschens, Ric. Musgrave, George Hurd. Scots' syes:—Robyn Hume, Andro Hume, Wm. Brumfeld, Emunde Trotter, John Crowe. Coldstreme, 10 Sept. England:—Lyell Graye, Herre Collingwode, John Kare, the lord of Cornell, John Haggarston, Jaret Selby. Scotland:—Steven Brumfelde, Nicholl Brumfelde, Sanders Hatle, Emunde Trotter, Andro Hume. Coldstreme, 10 Oct. England:—The lard of Gadareghte, Herre Collingwode, John Kare, Mehell Muschens, Wm. Bucton. Scotland:—Robyn Hume, the lord of Blenherne, the lord of Belle, George Crawe, Nicholl Brumfelide, Cuthbert Cranston. Coldstreme, 22 Oct. English syes:—Gelbart Swynno, Edw. Muschens, Wm. Bucton, John Folbery, John Selby of Gryndon Reghte, George Selby of Gryndon. Scots' syes:—John Hume of Hume, Robyn Hume, Thome Kare of Chernsyde, Stevyn Brumfelde, Cuthbart Cranston, Nicholl Brumfelde. English bills:—Bauffe Melle, (fn. n25) Hobbe Rowle, (fn. n28) Arche Dods, (fn. n28) Farebarne. (fn. n26) Scots' bills:—John Hume, (fn. n26) Tryamore Rudepethe, full of Farebarne for a horse, 20s., and other gear, 7s. 6d. Coldstreme, 8 Nov. England:—Sir Roger Graye, Lyell Graye, Herre Collyngwode, Wm. Bucton, John Kare, John Folbery. Scotland:—The lord of Langton, Robyn Hume, Cuthbert Cranston, Stephen Brumfelde, Thome Kare of Chernside, Edm. Trotter. English bills:—the lord of Cornell, (fn. n25) Rolle Karston, (fn. n28) Arche Dode for a horse at 40s. Scots' bills:—Ector of Furde qwyte by George Selby and George Hurde, Rychard Hurde and Rolle Karston full conditionally Dane Chernsyd full of Gelbart and Mehell Walles. Coldstreme, 26 Nov. England:—Lyell Graye, Edw. Muschens, John Kare, Clemet Muschens, George Selby, Wm. Bucton. Scotland:—the lord of Cokeburne, the lord of Belle, the lord of Blenherne, Robyn Hume Dande Cokeburne, George Crawe. English bills:—Rolle Karston, (fn. n28) Cuthbert Jackeson, (fn. n28) Hobbe Bowton (fn. n26) Scots' bills:—the lord of Belle, qwyte by Rye. Hurde, George Hurde, Antony Redderfurthe, John Redderfurthe, Gebbe Walles, and Mehell Walles; the parson of Donse bill full by Roger Muschens; the lord of Belle, (fn. n28) Robyn Hume. (fn. n26) The swearing of the English bills the same day:—Leonard Hurde bill delyvered for accordynge as it ys sworne and wryttynge wt. a Englesman hand in my lord Hume teket. Arche Dods James Anderson, for 18s, 8d. ; both delivered for. Swearing of Scotch bills:—Tryamore Rudepeth, 4 score groats; Davy Chernside, for 4 kye, 3 oxen, a mere at 15s., and a stote at 5s. ; the parson of Donse, for 7 oxen, 2 horses, 8 angels, 3 bridles and a tedder, 12d. ; all delivered for. Coldstreme, 17 Dec. England:—Lyell Graye, Herre Collyngwode, John Kare, Wm. Bucton, George Hurde, and the lord of Cornell. Scotland:—Robyn Hume, the lord of Langton, Stephen Brumfelde, the lord of Belle, George Crawe, Wm. Cokeburne. English bills:—"Cuthbert Jackeson bill qwyte by all named in the bill but Andrew Yonge and Herre Crowe, and they to qwyte it be for the lord of Aton or else to be full. Scots' bills:—Robyn Home, bill full by George Hurde, a grey horse, 30 angel nobles, a black horse, 15 angels, and a mere, 15 angels. Coldstreme, 25 Feb. England:—Sir Roger Gray, Edw. Muchens, Clemet Muschens, Wm. Bucton, John Kare, John Selby. Scotland:—the lord of Aton, the lord of Langton, the lord of Cokeburne, Wm. Cokeburne, John Crawe, Davy Crawe. English bills:—Wm. Hebburne, "delivered for" George Blacke. (fn. n29) Scots' bills:—Wm. Hudson, . (fn. n30) Wm. Browne full conditionally of Hudson of Hurde and Johen Lee. Nicholl Brumfelde, Emund Trotter, Sandy Hume, Cuthb. Hume, John Crawe. Pp.45 of which 10 are blank. 490. Lord Leonard Grey to Cromwell. The proceedings of Brian Ochonour "by his great labours and humble submission" shall appear by certain articles enclosed in this, sent by Matthew Kyng, to whom give credence. At their repair thither shortly the Commissioners will declare affairs here. Dublin, 11 March. Signed. ii. The manner of the parliament between lord Leonard Grey and Brian Ochonour in Offale, 2 March 29 Henry VIII. The said Brian would not come into the English Pale to parley, but agreed to send away his retinue a distance of three miles. Then the Deputy, with 800 men, came to Kennofad ford on the borders of Offale. Describes precautions taken against treachery (Ochonour gave his eldest and fourth sons and his chaplain as pledges) and the final meeting and offers of Ochonour, and his promise to come to Dublin on Tuesday, 5 March, to fulfil them. Add. : Lord Privy Seal. Endd. Holden at Edinburgh, 11 March 1537, by lords commissioners, viz., Gavin, abp. of Glasgow, Chancellor, Henry, bp. of Galloway, Jas., bp. 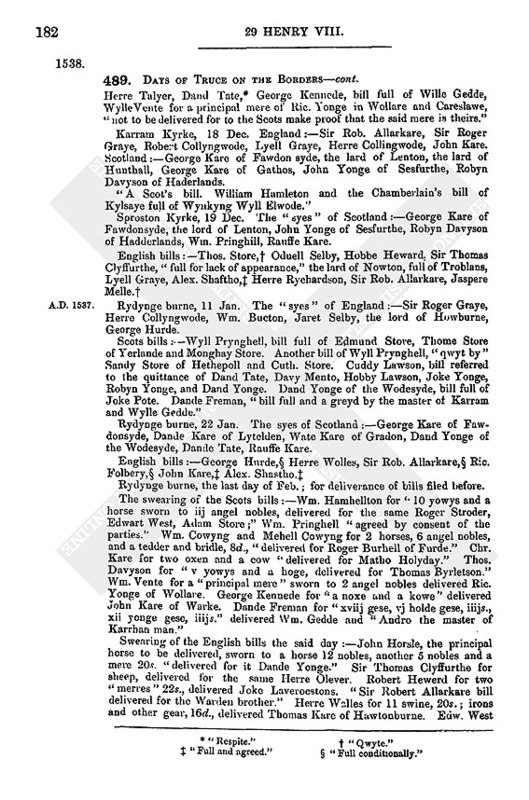 of Ross, George, earl of Rothes, John, lord Erskine, Alex., abbot of Cambuskenneth, &c. Prorogued to 26 June. 492. Katherine Bulkeley, Abbess of Godstowe, to Cromwell. I send you the patent of the stewardship of this monastery, which I was informed last week, by the dean of the Arches' letters, you are good enough to accept. Godistowe, 12 March. 493. Freshwater, Isle of Wight. 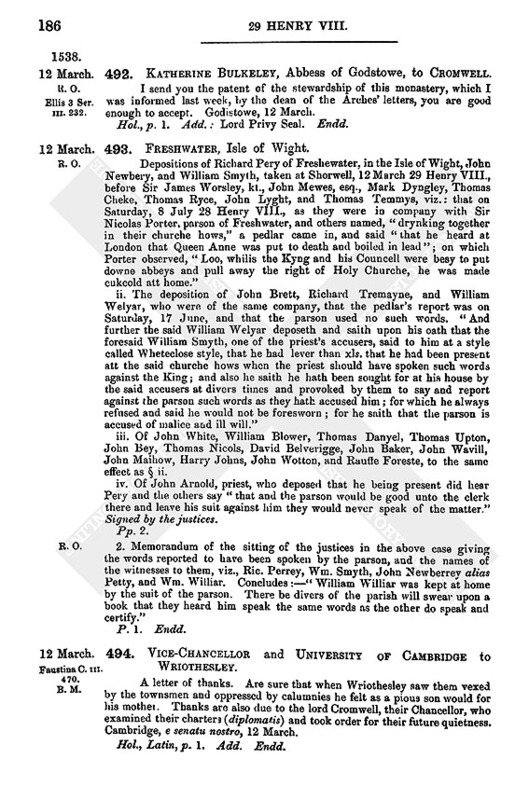 Depositions of Richard Pery of Freshewater, in the Isle of Wight, John Newbery, and William Smyth, taken at Shorwell, 12 March 29 Henry VIII., before Sir James Worsley, kt., John Mewes, esq., Mark Dyngley, Thomas Cheke, Thomas Ryce, John Lyght, and Thomas Temmys, viz. : that on Saturday, 8 July 28 Henry VIII., as they were in company with Sir Nicolas Porter, parson of Freshwater, and others named, drynking together in their churche hows, a pedlar came in, and said that he heard at London that Queen Anne was put to death and boiled in lead; on which Porter observed, Loo, whilis the Kyng and his Councell were besy to put downe abbeys and pull away the right of Holy Churche, he was made cukcold att home. ii. The deposition of John Brett, Richard Tremayne, and William Welyar, who were of the same company, that the pedlar's report was on Saturday, 17 June, and that the parson used no such words. And further the said William Welyar deposeth and saith upon his oath that the foresaid William Smyth, one of the priest's accusers, said to him at a style called Wheteclose style, that he had lever than xls. That he had been present att the said churche hows when the priest should have spoken such words against the King; and also he saith he hath been sought for at his house by the said accusers at divers times and provoked by them to say and report against the parson such words as they hath accused him; for which he always refused and said he would not be foresworn; for he saith that the parson is accused of malice and ill will. iii. Of John White, William Blower, Thomas Danyel, Thomas Upton, John Bey, Thomas Nicols, David Belverigge, John Baker, John Wavill, John Maihow, Harry Johns, John Wotton, and Rauffe Foreste, to the same effect as (fn. n28) ii. iv. Of John Arnold, priest, who deposed that he being present did hear Pery and the others say that and the parson would be good unto the clerk there and leave his suit against him they would never speak of the matter. Signed by the justices. 2. Memorandum of the sitting of the justices in the above case giving the words reported to have been spoken by the parson, and the names of the witnesses to them, viz., Ric. Perrey, Wm. Smyth, John Newberrey alias Petty, and Wm. Williar. Concludes:—"William Williar was kept at home by the suit of the parson. There be divers of the parish will swear upon a book that they heard him speak the same words as the other do speak and certify." 494. Vice-Chancellor and University of Cambridge to Wriothesley. A letter of thanks. Are sure that when Wriothesley saw them vexed by the townsmen and oppressed by calumnies he felt as a pious son would for his mother. Thanks are also due to the lord Cromwell, their Chancellor, who examined their charter (diplomatis) and took order for their future quietness. Cambridge, e senatu nostro, 12 March. Hol., Latin, p. 1. Add. Endd. 495. Bp. Roland Lee to Cromwell. It has pleased God to cull unto his mercy Mr. Walter Welshe, who had the keeping of the King's park at Wigmore. Please remember for that office your Lordship's servant, Thomas Crofte, being deputy constable, under his father Sir Edward Crofte, of the castle of Wigmore, situate in the said park. In case it be already given, help him to it as deputy. Shrowisbury, 12 March. Signed. P. 1. Add. : Lord Cromwell, lord Privy Seal. Endd. 496. Thomas Crofte to Cromwell. Begs he may have the keepership of Wigmore park, which environs the castle where he dwells, as Master Welsh had it before him. Has sent another letter to Cromwell by the bearer, who will wait upon him though it be these 12 months. Hol., p. 1. Add. : Privy Seal. Endd. 497. Ormond to [the Irish Commissioners]. Sorry I cannot now at your departure show you some things which might redound to the King's profit, but my son, the Treasurer, will do so. The Deputy, until summer, should take a truce with Oneyle, Oreylye, and the Irishry of those parts, and practise with the Birnes and Tooles so as to be sure of these quarters in dealing with Ochonour; but nothing is so needful as to diminish the McMorrowes and Kavanaghes, who, though for years mortal enemies, have lately united against the Englishry. Ormond's son Richard is the King's constable of Fernes, long in their possession, and were it not to do the King service he would not suffer him to risk living there so near the Kavanaghes. The highest enterprise is to destroy the Kavanaghes, which might be done by a joint attack from the Deputy with the Englishry, Wm. Sentloo with the county of Wexford, and the writer with his own power. These Kavanaghes are surrounded by the Englishry, not like O'Connour, who borders with the greatest Irishry. If this is delayed, as the Mores of Leys are in division, Woodstock should be repaired and the Fasagh Rebane and other holds in Leys strengthened, and McGfilpatrick, OKarroll, OMeagher, and other Irishry there brought to further subjection. As James of Desmond has put his son into the King's hands, now is the time to begin a reformation of Munster. Hitherto they have always answered that they would follow if the writer would begin, and he has been so occupied with the Geraldines and the Irishry that he has been forced to let them have their own way. Has, with other Commissioners, been assessing the First fruits and Twentieth of the Spiritualty. Has prohibited various abuses (named) in Tipperary. In Kilkenny, for lack of the same authority, he has not been able to do so much, but will endeavour to reform them and get them to contribute to the charges of the administration of justice; being sure your wisdomes will have regard to the rudeness and ignorance of the people. My son James has showed me a letter from you, for the "entertainment" of O'Connor's galloglasses. I am content to retain them. O'Connor has written to Edm. McSwyne, captain of a far greater power of galloglasses "to retain"; but I have sent for him, as I would rather have him at my own charges than see him in wages with O'Connor. The King by word of mouth willed me to consult the Council upon matters of government, and the Council to ensue my devices. I desire therefore to know your devices that I may advise thereupon. Fytherd, 12 March. 498. The Ambassador Figuerroa to Charles V.
Wrote on the 1st by the prince of Melfi. The Pope's coming to Nice, The King of the Romans. News of the death of Barbarossa untrue. Genoa, 12 March 1538. 499. Henry VIII. to Christian III. Rejoices to hear of his inclination to true religion. Is sending Dericus, the bearer, his messenger at arms, upon business to the consuls and senators of Lubeck, and takes this opportunity of writing and also of asking Christian's safe conduct for the said Dericus. Palace near London, 13 March 1537. Latin. Countersigned by Peter Vannes. 500. W. earl of Southampton to Cromwell. I have received your Lordship's letter, dated 11th inst., by my servants; and Ralph Adyshede therewith, whom I shall order accordingly. I have sent you by bearer certain Celsey cockles. No doubt you are daily furnished with them by my lord of Chichester, who is lord of the soil where they be had; if not, I would he should eat none of these cockles, and as long as I am in this country your Lordship shall not lack them. At my house of Cowdrey, 13 March. Signed. P.S.—In his own hand: Tomorrow I propose to be at Portsmouth. 501. Germayn Gardyner to Wriothesley. Begs him either to write or to send Mr. Parys. His last short letters signifying the King's contentation were so welcome that he is anxious for the declaration thereof. If he tells Barnabe that he loves Gardyner it will be great sport, as he will endeavour to persuade Gardyner of it with obtestations and oaths. Molines, 13 March. This letter has been delayed till the 18th in hope of Fraunceys. Hol., p. 1. Add. : brother. 502. Charles V. to Aguilar. Wrote last on the 6th. Acknowledges letters of 25 and 28 Feb. The proposed interview at Nice. Death of Barbarossa not confirmed. The state of the negotiations with England appears by the relacion enclosed. Precautions necessary for the meeting at Nice. Spanish, pp. 8. Modern copy from the archives of Simancas, headed: Al marques de Aguilar, de Barcelona, 13 de Marco 1538. 503. Sir John Dudley to Lord Lisle. Sends news current with us who are of the Court and not of the Council. It is said we shall have a great master of the household, as in France, and the old ordinary shall be altered. There shall be 50 spears with the earl of Hampton for captain. Other news there is which I need not write, for, if true, you know it better than we do. Is at a point with Mr. Hyde, and asks favour. London, 14 March. My daughter of Surrey is brought to bed of a son (fn. n33) and, notwithstanding she looked not to have been delivered till after Palm Sunday, the child is as lusty a boy as need be. Had she gone her full reckoning and had a son I intended to have asked the King to have had it christened in his name, and your Lordship to have been other godfather, but now the women here would not suffer me to let the child be so long unchristened. I rejoice to see my two sons have two sons of age to await on my lord Prince; trusting that when time shall be, the King will have them to await upon him. The great sickness continues here, and I am banished by it from my two "starting holes," Castellacre and Bongaye. I require you to send me, by this bearer, my will, which ye have sealed in a box. I must alter things therein, for my substance in money and plate is not so good now by 2,000l., "a man can not have his cake and eat his cake." You thought you knew who would buy my manor of Walton, that was of the house of Lewes, at 40 years' purchase; let me know his name and prick him to conclude for it. I am forced to sell much land for lack of money, and divers are on hand with me to buy, with whom I would not meddle if I might sell Walton after that price. Speak to my Lady my mother-in-law for the agistment of Bewbusshe park; it is time to speak for Lady Day draws nigh. Kenyngale, 14 March. Signed. Pp. 2. Add. : Lord Privy Seal. Sealed. Endd. 505. Ric. 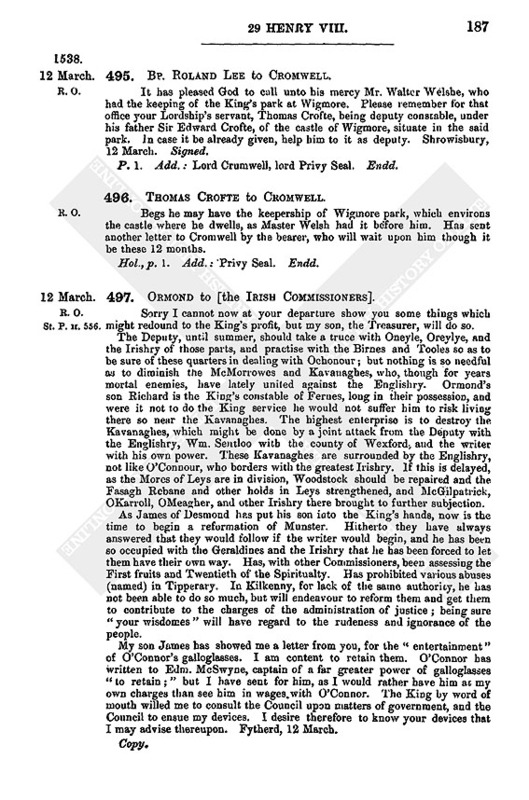 Abbot of Wynchelcombe to Cromwell. On the 13th March received his letter accepting the high stewardship of the monastery vacant by the death of Master Welshe. The fee is but 5l., but there is a "pratty manredde" belonging to it, so that he will have 200 or 300 men at his commandment to serve the King. Asks him to let Mr. Draycotte continue under-keeper of Sydeley park. He is a good gentleman, beloved in the country, and has been long in that office, and can best skill of any man that I do know, in keeping the King's deer. Has not sent the office of high stewardship under the convent seal because he could not find in the monastery "so formall a precedent to make it by" as he would have. Will send it before long with his son Gregory joined with him. Wynchelcombe, 14 March. 506. Anthoine Brusset to Lord Lisle. As people here talk much more more about war than peace, I venture to write to you, knowing that you may have good information. I beg you to inform me what you know. Gravelines, 14 March 1537. I am told today that the French king is coming shortly to Amiens, which I cannot believe. Signed. On the evening of the 10th inst. Philip Hobbie, and a servant of the King named Mr. Haunce (fn. n34) arrived here, bringing Cromwell's letter dated St. James, 2nd inst. Had sent off a servant the day before with a portrait of the duchess of Milan, and despatched another man after him. Gives an account of his interview with the Queen Regent, and with the Duchess, who consented to have her portrait taken. Next day lord Benedike Court came from Mr. Haunce," who, having but three hours space, hath showed himself to be master of that science, for it is very perfect." Hoby took his leave of the Duchess that night, but did not wait on the Lady Regent lest what he came for might be discovered. 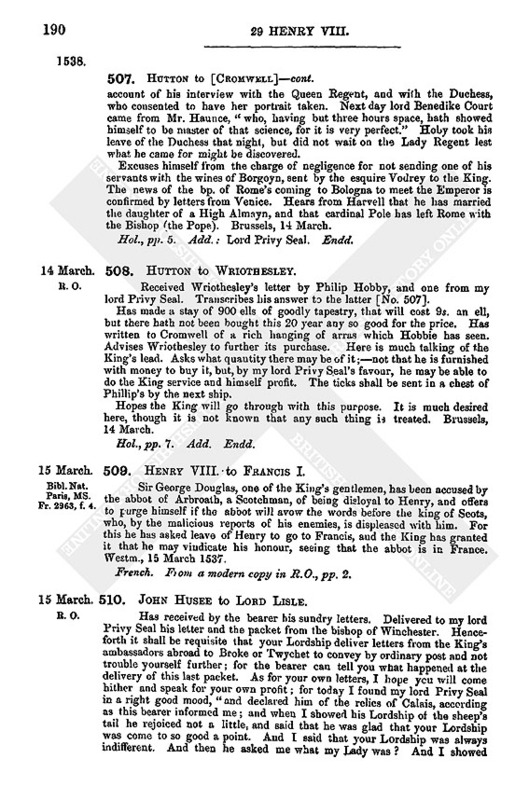 Excuses himself from the charge of negligence for not sending one of his servants with the wines of Borgoyn, sent by the esquire Vodrey to the King. The news of the bp. of Rome's coming to Bologna to meet the Emperor is confirmed by letters from Venice. Hears from Harvell that he has married the daughter of a High Almayn, and that cardinal Pole has left Rome with the Bishop (the Pope). Brussels, 14 March. Hol., pp. 5. Add. : Lord Privy Seal. Endd. Received Wriothesley's letter by Philip Hobby, and one from my lord Privy Seal. Transcribes his answer to the latter [No. 507]. Has made a, stay of 900 ells of goodly tapestry, that will cost 9s. an ell, but there hath not been bought this 20 year any so good for the price. Has written to Cromwell of a rich hanging of arras which Hobbie has seen. Advises Wriothesley to further its purchase. Here is much talking of the King's lead. Asks what quantity there may be of it;—not that he is furnished with money to buy it, but, by my lord Privy Seal's favour, he may be able to do the King service and himself profit. The ticks shall be sent in a chest of Phillip's by the next ship. Hol., pp. 7. Add. Endd. 509. Henry VIII. to Francis I.
French. From a modern copy in R.O., pp. 2. 510. John Husee to Lord Lisle. Has received by the bearer his sundry letters. Delivered to my lord Privy Seal his letter and the packet from the bishop of Winchester. Henceforth it shall be requisite that your Lordship deliver letters from the King's ambassadors abroad to Broke or Twychet to convey by ordinary post and not trouble yourself further; for the bearer can tell you what happened at the delivery of this last packet. As for your own letters, I hope you will come hither and speak for your own profit; for today I found my lord Privy Seal in a right good mood, and declared him of the relics of Calais, according as this bearer informed me; and when I showed his Lordship of the sheep's tail he rejoiced not a little, and said that he was glad that your Lordship was come to so good a point. And I said that your Lordship was always indifferent. And then he asked me what my Lady was? And I showed him, nothing so scrupulous as it hath been reported. And then he said there was no doubt but she would be won a little and a little." He said he had sent for Mr. Stookes, and I told him he had gone to the bishop of Bath. He said he should come wherever he was. I desired to know Ms pleasure, declaring further unto him of the good news which he showed me that I should hear shortly of. He said he hoped your Lordship would soon have leave to come over, and that when Mr. Stookes came I should know further. Advises Lisle to be prepared to come at any time, and to appoint those who shall come with him—not more than eight or ten. The matter should be kept secret, for my Lord told me not to write till I knew more; but I have good hope of seeing you here in 14 days. When Justyce comes' I will do my best for him. My lord Privy Seal said he would commune with Marche about the ship taken to Fecckam (Fécamp). Will take advice of learned counsel before going through with Hide, and so see his Lordship well assured of his rent. This bearer can partly report what Sir John Dudley said. He promised to help if anything could be found meet for Mrs. Elizabeth. Will meddle no further with him for Kybworth till I hear what state he hath of his lands in Kent. Doubts not Lisle will overcome the malice of the Porter and Marshal. If anything come that way it is by the surveyor, whom I trust no further than I do see. He is very great with Mr. Wryothesley. Mr. Bryan was ridden to Anthill before Mr. Spykott came. Sent the gown which Mr. Mewtas had by Harwoodd. It is thought that the affair of the duchess of Milan will take place, and that the King will be at Calais before Whitsuntide. Can do little for Gwyllam Arnawt. The abbot of Westminster will not meddle till he have both tuns of wine. Mr. Bonham has offered 60l. I see his desire is to have it. He is a goodly young man, and a gentle. I proposed 100l., but I will see what shift he can make among his friends. Wycks has put up divers supplications. Blames Lisle's officers for their negligence in leaving the old indenture in Prosser's hands; for if there is any record that Prosser was lawfully put out, my lord of Harford must restore him. Hears of no commissioners coming over. When Popley's man comes from the bp. of Bath I will arrange with him for the prebend. Can hear nothing of Baptista de Cassigny. The Household is to be arranged as it is in France, and a gran mastre de hostell made, and also certain spears. London, 15 March. 511. John Husee to Lady Lisle. I have received your letter and am glad that Cosers and Campy on were pleased, I have today talked with Mr. Bonham, who says he cannot go further than 60l. I offered it to him for 100l., and when I left him the water was in his eyes. He thanked my Lord and you for your goodness in giving him the offer. I assure you he is a goodly gentleman. I advised him to consult his friends a day or two, and then give me a final answer. I hope to go through with Hyde and make all things sure both for my Lord and Mr. Aylmer. If Wyckes came lawfully into his hold my Lord has nothing more to do with it. Mrs. Wilkenson was well pleased when I showed her Mr. Hutten's letter, and swore she never moved the matter to any one but myself. Mrs. Elizabeth, I know, will be glad of her gown. Mrs. Anne must have an edge of pearl against Easter. Mrs. Elizabeth showed me the edge of goldsmith's work you gave her. Mrs. Oxenbridge has written for her sister, who will be with you shortly, either from hence or from Rye; but Mrs. Weldon will not let her daughter go to Calais. I will look out for some other honest woman for you. I can hear nothing of Mrs. Raynold's woman. At my going into Hampshire I shall cause Philpott to go over. I hope the spices and oranges have arrived at Calais. I trust your Ladyship will yet have the travers I will send the two pieces of say and your matins book shortly. Mrs. Frances shall have her gown made and sent as soon as can be. I hear nothing of the man of Guilliam le Grace, called Baptista de Casigny. I advise you to stay Mr. Basset's coming over till I see if the plague ceases. I hope Mr. George will do well. If not, you may the sooner have him away. If Cobley's weir shall stand, I will undertake yours shall. We can hear nothing of my lord of Essex, but if your Ladyship send the wine and herring I will send one to give him knowledge. My lord of Sussex did not dispraise the wine, but he loves none but mighty great wines. My lady Sussex would be glad to hear of Mrs. Mary's coming home. Here is a priest, who would be glad to serve my Lord and you. He seems a right honest man, and I think your Ladyship lacketh such one. Mr. St. Awbyn sends you 12 puffins. London, 15 March. 512. Anne Basset to Lady Lisle. Sends commendations to her father and mother, desiring her daily blessing. Begs she may not be considered ungrateful for not writing since coming to England; for surely where your Ladyship doth think that I can write English, in very deed I cannot, but that little that I can write is French, and to cause any other to write for me unto your Ladyship in English, I know not whom I may trust to open my mind unto. Trusts she will not offend again. My lady of Sussex will not let me part with the French partlet. Thank Mrs. Gryffyn for her token. I will not fail to write at leisure to Madame de Ryew, with some little token for her kind remembrance. Except the "jesrome" (bracelet) I have received all my things by Hugh Philkoukes. Please send it and a frontlet, for James had the frontlet of black velvet your Ladyship sent me. If you would send me an edge of pearl and a tablet to wear I shall be much bound to you. I find my lord and lady Sussex very good to me. My Lady tarryeth but for her good hour. My cousin Jane Aroundell and my cousin Staynengs, Mrs. Oxenbrige, and all gentlemen here desire their commendations. I sent you by Corbet and Mrs. London two tokens. Can make her no return for the trouble she has taken in her improvement and advancement. My lord of Sussex findeth no fault with the wine you sent him, only that the same is small, for I perceive he loves great and mighty wines. Desires her commendations to her brothers and sisters. London, 15 March. Has written to Madame de Ryewe and sent her a pair of Garnsay sleeves. Signed. In Hussey's hand, pp. 2. Add. 513. The Mayor and Jurats of Rye to Cromwell. Received, 4 March, his letter written at the Rolls, for them to restore to Richard Hylton and other, of London, 6 tuns of wine they have taken out of the Mary of Salcome. Took it by the Lord Warden's command. The 6 tuns were promised by the Flemings to William Tele, of Rye, to save the ship where she was in great danger. Hylton and other have the Flemings in suit in the Court of Admiralty at London. The Lord Warden says, if Cromwell will write to him, he will make reasonable answer. Rye 15 March. n1. See Nos. 260, 285, and 444.
n5. These Refused to follow. n14. "These are marked Agreed." n33. "This was Thomas, who became fourth duke of Norfolk in 1554, his father's and grandfather's attainders being reversed.